At the Boston University School of Theology’s “Moral Courage and Guns” panel, moderator Andrew Kimble began by taking a brief survey. He asked first if anyone had ever been threatened by with a gun or lost a family member or a friend to gun violence, then asked who had any positive experiences with a firearm, like hunting, and finally asked who believed that gun regulation needs to change. Nearly the entire room raised their hands when asked the last question. 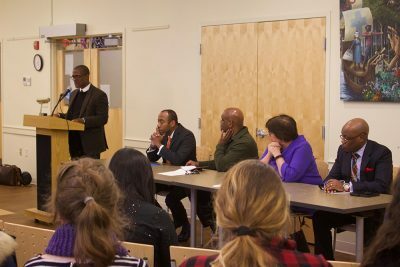 The panel was hosted by STH and co-sponsored by the Religion and Conflict Transformation program, Community Life and the Association of Black Seminarians. A crowd of about 40 students and faculty came to listen to the discussion. Emily Ling, a graduate divinity student in STH and program administrator for the Religion and Conflict Transformation program, helped organize the discussion. Ling said the panel was organized to provide a diverse range of perspectives on the issue. Throughout the evening, panelists shared various ways they believed gun culture could change. “This conversation takes place in the context of a pervasiveness of the technology in terms of guns but also pervasive gun culture,” said Cornell Brooks, a visiting law professor. Judith Oleson, co-director of the STH Religion and Conflict Transformation program, said she believes the wording of the debate around gun control needs to change. Abrigal Forrester, director of community action at Madison Park Development Corporation, spoke more about who the discussion should be targeting and focusing on. Forrester also addressed recent chatter about arming teachers in schools, saying how he does not believe this is an effective solution. Weighing in, Dean of Students Kenneth Elmore said that society cannot wait for government to cause change. It has to come from the people. One of Elmore’s last comments elicited laughs throughout the room. Following the panel, Brooks said he hopes people walked away from the discussion more hopeful about the future of gun control and the conversation around firearms policy in America. Brooks said students seeking opportunities to advocate for gun restrictions should research more into social justice and gun violence. Emelia Attridge, a graduate divinity student in STH, said she walked away with a new sense of hope after hearing the different viewpoints of the panelists.